While the LlamaZOO team attended events, conferences, talks, demonstrations and launches across Canada (see our previous blog post about all of that awesome hustle), the team also found time to visit customers and partners from coast to coast as well. Kevin, Keith and Christine spent a lot of time on the road in the first months of 2019. The team criss-crossed Canada to help businesses and governments determine practical solutions for business problems by using data liberation, integration and visualization. Elk Valley is known around the world for being a top source of metallurgical coal for the steel industry. 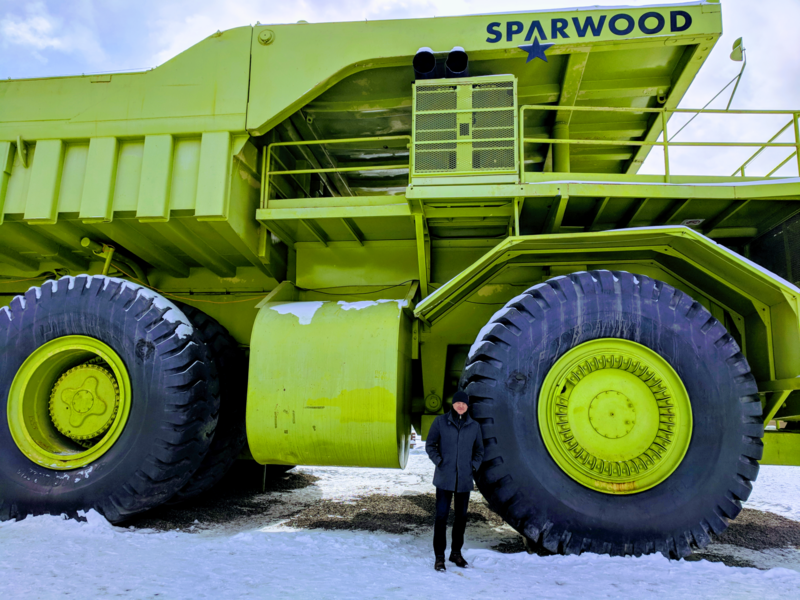 Besides stopping in Sparwood to snap a photo of what was once the largest haul-truck in the world, LlamaZOO spoke to resource companies in the Elk Valley region, providing insights about how to improve community engagement around reclamation around current and potential sites. Kevin and Keith traveled to Fort Mac to demonstrate how LlamaZOO can help make training more efficient and effective in the oil patch. Everything in Fort McMurray, from the size of the oil sands mining sites to the equipment and assets, is in very big-scale. Machines are heavy and complicated, and maintenance turnaround can take a long time. In an environment where margins can be slim, eliminating downtime is critical. On top of that, the skilled workforce that maintains and operates these machines is retiring out. As employees leave the energy industry, they take with them a vast amount of knowledge that can’t easily be replaced. LlamaZOO can help with both of these challenges. By using Clarity 3D, these companies can improve the effectiveness of training, and pass on knowledge to younger employees, and keep everything running. Kevin and Keith also made another trip to visit several refineries, upgraders and petrochemical facilities in Edmonton. LlamaZOO’s Clarity 3D digital twinning is used to compare as-built to as-designed for faster turnarounds and installations. Mining companies in Quebec are focusing on incorporating technology and innovation as much as possible into their operations going forward. Keith and Kevin traveled to Quebec to demonstrate how LlamaZOO’s Clarity 3D software app can be used to improve the effectiveness of training, and how OCC 3D can make live operations more efficient and precise. LlamaZOO visited eastern Ontario to explain how our technology can help municipal governments connect citizens with data and make civil planning more efficient. For example, local governments can use LlamaZOO’s expertise with data integration to display any and all geoscientific information that a local government might have access to, to help plan buildings, tunnels, roads and other infrastructure. Following Christine’s efforts in Kamloops at the ABCF annual meeting in February, Keith and Kevin visited Prince George and Quesnel to discuss how Forest Ops 3D can help higher education and industry to collaborate on new training, procedures and products.